observing plan for Algol minima. Recall that in the last December 1 post, we discussed how the star image of Algol was completely saturated for as little as two second exposure times. One of our homework items was to take some more images of Algol and determine a good exposure time. The image shown below was taken from the back patio at the observatory. 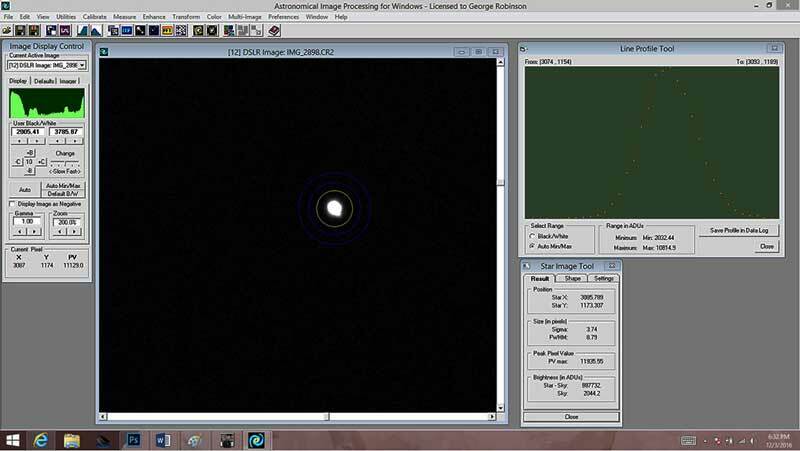 I uploaded the camera image to astrometry.net and verified that the image indeed was of Algol. In that field of view, Algol is the only bright star with other stars magnitude 4 and dimmer. This 1/2 second exposure is a pretty good compromise in that it just barely starts to reach into the saturated region. For my camera, any ADU values above 15000 are definitely saturated and we found many instances of saturated pixels in the two second exposures. Look at the star profile (below) and see how the maximum ADU value is 11935 and the profile has a nice peaked shape without any obvious saturation effects. The total light collected by all pixels illuminated by the star is also seen to be 887,732. The peak pixel value of 11935 is maybe just a bit too high, but remember we are planning on using this same exposure setting when the eclipse causes the star magnitude to decrease from 2.1 to 3.3, which means only 1/3 the amount of light. So, the maximum ADU value is expected to be only about 4,000 during the eclipse. Oops, I just recognized a problem that will come up during the actual eclipse measurement. When the eclipse gets going, Algol is going to dim and I will have a hard time seeing the star and won't be able to use the red dot finder to keep the camera pointing in the right direction. During the 3-4 hours of eclipse observation, Algol and other background stars will be slowing rotating and changing position and since I am not using a goto tracting mount, I have to manually move the tripod pointing direction to follow Algol's movement, but I am not going to be able to easily see a magnitude 3.3 star. Oh-oh, what to do? I don't really want to go to a darker sky location since I like being able to come in from the cold periodically and sit down, have a drink, or what ever and want to make this measurement here at the observatory. I can't readily change the plan and use a tracking mount because the back patio location does not have good viewing in many directions due to close by trees, even though the view directly overhead is quite good. It turns out that the location of Algol will be mostly high overhead with something like 75 degree elevation during the eclipse. So, I think my revised action plan is still to just rely on old fashioned star hopping and try to aim the camera right at the location where I imagine Algol to be or maybe if I'm lucky can just barely see it to be. 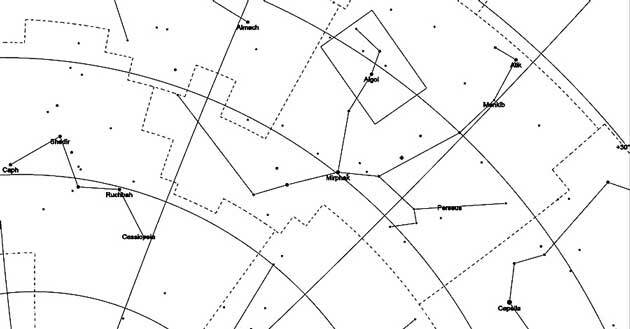 My observing plan is to use two other bright stars in Perseus, Almach and Mirfak, as baseline stars from which I will position my camera frame so that the imagined position of the dim Algol is right in the center. Check out the star chart below. Since my pointing accuracy is compromised in this dim Algol condition, I am using a wider field of view with the telephoto lens set to widest setting of 150 nm. The rectangle around Algol is the field of view, which gives me more leeway in pointing accuracy. At the same time, changing the focal length from 500mm to 150mm means the camera exposure time will need to be increased from 1/2 second to about 2 seconds to achieve the same exposure level. My plan is to use two Cassiopeia stars that point just about right at Almach, from which I can spot Mirphak, which is about half way to bright Capella. Then I'll remember to split the distance between Almach and Mirphak and move about half that total distance towards the expected location of Algol. I think it should work out ok, but I want to schedule at least one more day, weather permitting, to practice and get some experience recognizing the stars used in this star hopping exercise. 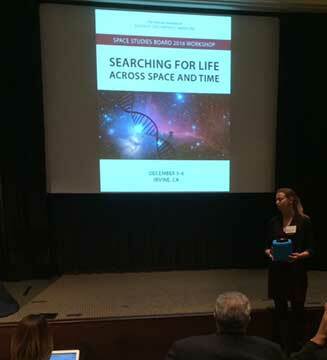 Ok, until that practice session can be found, let's go back to the Searching for Life workshop. This was a real working meeting with scientists from various government agencies who were soliciting help and support in developing an understanding of the current limits on detecting life in the universe, primarily through the use of biosignatures, measured in-situ or remotely. This work is very collaborative and multidisciplinary and includes team members from astronomy, geology, biology and other sciences and engineering disciplines. I signed up, not as an expert in anything, just as a physicist wannabe. I signed up and my badge is shown below. Resident Astronomer Peggy wondered about the "retired" attribute and asked if it meant that the observatory was retired? Oops, no that is not what I had in mind. I'm still working through what it means to be a retired person and I just typed it in the wrong location. 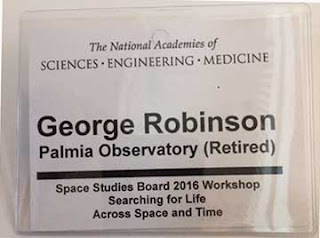 Hey, no, wait just a minute here, because it now seems that I am not retired at all because I have a new full time job as a Resident Astronomer. 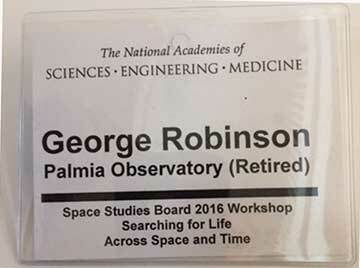 Yes, that is it, I'm not retired, I'm now just a Resident Astronomer. The workshop was very interesting and the whole nature of biosignatures is really interesting in that the effects left behind by living organisms seems easily recognizable, but when these effects are studied in far away distant environments, like Mars or exoplanets, it gets very complicated and difficult not to be fooled by natural, but not alive, processes, that mimic some of the same observable results. For instance, high atmospheric oxygen levels and other conditions indicating disequilibria are often said to be good biosignatures of life, but one must be careful to rule out some possible, but maybe not likely, other naturally occurring processes. Making these measurements remotely with telescopes and spectrometers or locally with remotely operated roving laboratories also complicates the types of observations and measurements that can be made. It seems clear that all life requires some form of metabolism, that takes nutrients and free energy from the environment and expels waste and entropic losses, even though the chemical basis can be quite different from our own chemical natures. There is also the separate issue regarding how to search for life when it could be based on a completely different chemistry. At the same time, several presenters talked about how DNA, from which all life on earth is based, might be the universal material from which other life forms in far off solar systems, would also use, because of the growing recognition that this form of DNA possesses good stability features that far exceeds that of hundreds of similarly constructed and tested versions of DNA used to evaluate how and why this form was selected for use on Earth. It was also interesting to hear that you can now buy your own DNA sequencer, being considered for some future space missions, which is controlled by your Iphone, for about $1000 and you can collect and sequence DNA from samples of your own choosing. Rather than have me try to explain all of the details (I probably can't remember or understand a lot of them anyway), if you are interested, you will probably come out ahead by viewing the videos when they become available in a week or two at the Space Studies Board website. One innovation at the workshop that struck me as very good was the introduction of a wireless microphone, housed in a soft, padded enclosure, that could be readily tossed around and up and down the auditorium so that audience members could ask their questions, which at the same time would be audible for the rest of us in the auditorium and those listening in on the web. There were a couple of anxious moments as the microphone was being tossed over the heads of audience members, but it all seemed to work out ok. One participant, who had to toss the microphone up to another participant, commented wryly that he became a scientist because he was not very good at sports and he thought he had left that embarrassing situation behind him and yet here he was again, forced into throwing the ball around. Finally before we get to the calendar of upcoming events. I want to mention an email I received about viewing some of the UCR lecture series . Recall that Science Squad Gravity Guy, Ken, alerted us to the ongoing public lecture series at UCR, titled "Are we Alone? ", but its not really that close by for those of us in OC or beyond. But, I got a note from Retired, Big Oil Chemist, Dr. Arnold, who forwarded the website where the recorded lectures could be found. So if you are interested in checking out that lecture series and don't want to drive to UCR, check out: http://cnas.ucr.edu/sciencelectures/. Thank you Ken and Arnold for the heads up! Remember the other activities going on this week, too, including the free lecture (you will need to sign up for a ticket, though) on Ocean Worlds of the outer Solar System at the Beckman Center at UCI, Wednesday, December 7. Also, don't forget the OCA general meeting this Friday at Chapman University, where we will hear about "Exploring the birth of rocky planets". And for you really serious physicist wannabes or astronomer wannabes, its time to plan to attend the American Astronomical Society 229th General Meeting in Grapevine, Texas, on Jan 3-7, 2017. I've always enjoyed the meeting, even if a lot of the sessions are way over my head, so I'll see you there!